The Audio Spotlight is a revolutionary directional audio technology that creates sound in a narrow beam, just like light. Aim the flat, thin focused sound speaker panel to your desired listening area, and provide all of the sound and none of the noise.™ Our larger Audio Spotlight AS-24i offers the strongest output and deepest low frequency response of all models. This parametric speaker is designed for competing with noisier environments or areas requiring more coverage. The AS-24i is a great highly directional speaker for museums, trade shows, supermarkets, outdoor applications, and many retail environments, and it easily replaces standard 2'x2' ceiling tile with no additional hardware. Our larger Audio Spotlight AS-24i offers the strongest output and deepest low frequency response of all models. This target speaker system is designed for competing with noisier environments or areas requiring more coverage. Great for museums, trade shows, supermarkets, outdoor applications, and many retail environments. 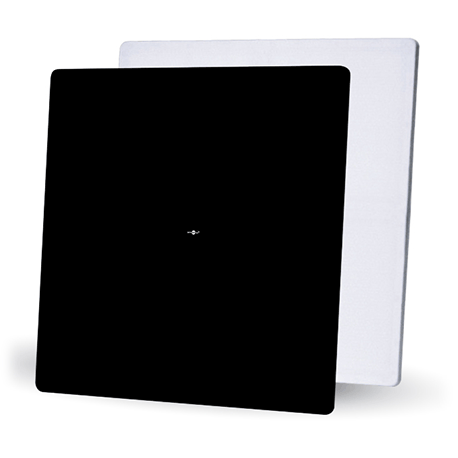 Easily replaces standard 2'x2' (60cm) ceiling tile with no additional hardware. Built-in microSD player, and balanced and unbalanced audio inputs standard. Bluetooth and motion sensor options available. For pricing and to inquire about Reseller/Wholesale Purchasing & Application Support.